IT’S A SCIENTIFIC FACT that if an adult on a Razor scooter passes by a large gathering of children, at least one of those kids will shout an insult. Usually, it’s just a “Nice scooter!” yelled in a joking, condescending manner that elicits laughter from the other kids. Punks. I’ve learned this the hard way. Groups on a field trip are especially bad. Yet, it’s the risk I take during my morning commute. 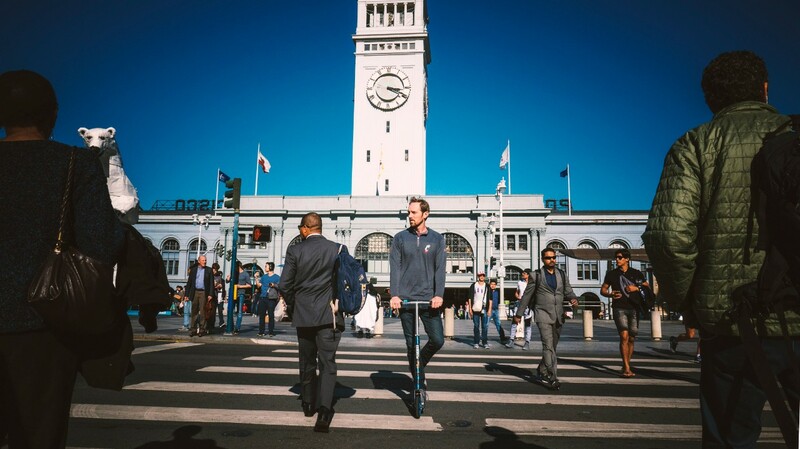 My scooter significantly cuts down the travel time between the train station and my company’s San Francisco office. And time, as they say, is money. Fortunately, my co-workers are kinder about my commute methods. In fact, no one I’ve met working in the startup world bats an eye at such things. That’s because you don’t get style points working in technology — I’m certainly not winning awards for “best dressed” either. You’re simply judged by what you can produce. And that’s what I love about it. Everything moves fast, and you have to be incredibly adaptable. I work as the director of communications for a software company called JotForm, where, from the 18th floor of our office in downtown San Francisco, I watch cable cars haul eager tourists up a nearby hill. I take my lunch breaks at the beautiful Ferry Building near the Embarcadero and marvel at the abundance of gourmet coffee options I have every morning. And, during the four years I’ve worked at JotForm, the company has ballooned from just 35 employees to 130. Founded in 2006, JotForm is a plat - form that allows anyone to create and publish online forms. Think about any time you’ve filled out an application form, contact form, registration form or feedback form online. JotForm helps nontechnical people create those. 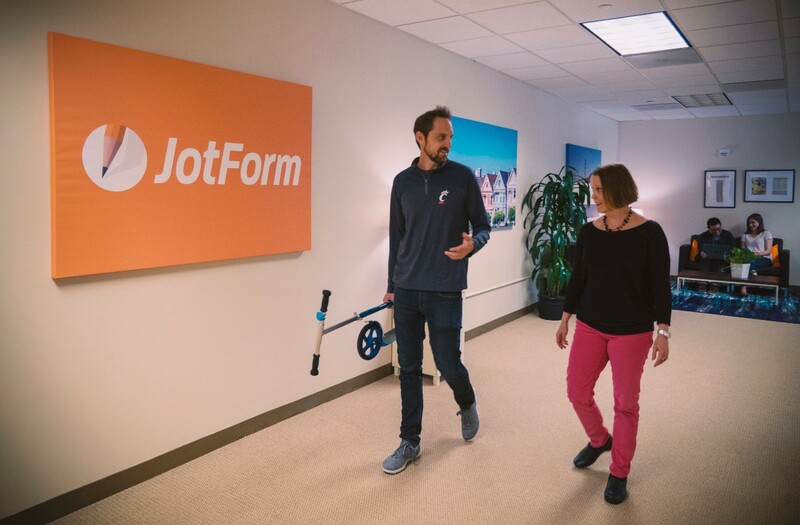 Among its 4 million users, JotForm counts Fortune 500 corporations, major universities (including a certain alma mater of mine) and thousands upon thousands of small businesses. Chances are you’ve filled out a form hosted by JotForm and didn’t even realize it. As is the case with jobs at many startups, I wear a lot of hats. Not only do I build relationships with reporters so that they will share JotForm news with their readers, but I manage a small team that writes blogs, produces videos and creates advertisements. I also help build strategic partnerships with other major tech companies in the area, including Square, Asana, Box, DocuSign and Zapier. I take none of it for granted. And my McMicken College of Arts and Sciences education from the University of Cincinnati helped get me here. The impact A&S can have on a career sometimes gets lost in the discussion of how great UC’s design, engineering, music and business programs are. But liberal arts is as relevant to the real world today as ever before, especially in tech. Companies need people who can write, communicate, research, survey and connect. They need thinkers and doers. Most of all, they need people who will pursue a project because it inspires them, not because it’s asked of them. And what better place to foster these skills than A&S? I earned both journalism and history degrees from UC. I didn’t know I wanted to work in tech at the time. I just wanted to study what made me happy. That’s the same approach I’ve taken so far in my career. California provided me a relatively soft landing coming from Cincinnati. There are nearly 4,000 UC alumni living in the San Francisco area alone, many of whom I meet at local alumni events. We watch football games together, go on hikes, volunteer and network. Some of my closest friends here are fellow Bearcats who I never met until I moved to the Bay Area. They all have different stories and came here for different reasons — many of them work in tech themselves. But it’s clear that the University of Cincinnati played an integral role in their career development as well. Best of all? None of my new Bearcat friends seem to mind the scooter, either.